Anna Sweeten is a realist landscape painter who has worked historically in egg tempera and more recently in both egg tempera and acrylic. Born in 1947 in eastern England, much of her inspiration has come from the sparsely populated flatlands of East Anglia. 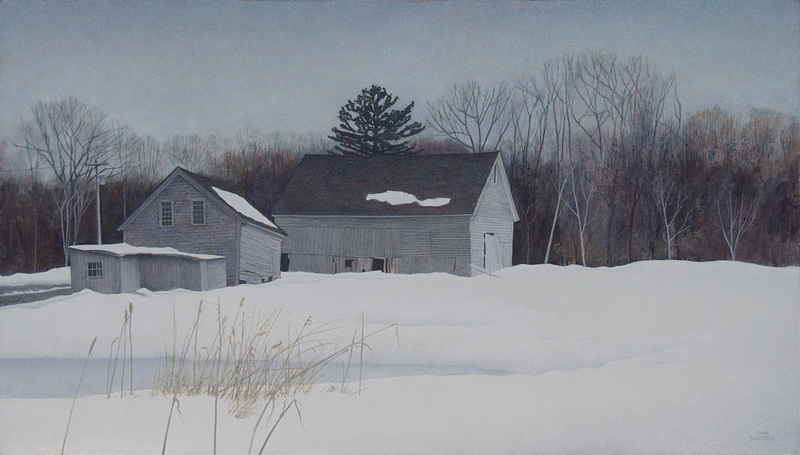 She has also concentrated on the landscapes of North America, in the Midwest and New England. When attending two art colleges in England in the 1960s – when abstraction was the orthodoxy—Sweeten found that her interest in realism was actively discouraged. The path that she has followed has therefore resulted from her own extended studies. The egg tempera painting techniques that Sweeten employs originated in Italy in the 1300s. She begins by breaking an egg, separating the yolk from the white and carefully puncturing the yolk sac to pour the pure egg yolk in a small bowl. After mixing this with distilled water, she makes a paste of pure ground pigment and distilled water, then adds this to the egg emulsion. The pigments are almost all the same natural materials that were used by the painters of the Italian Renaissance, although she uses some modern chemical pigments such as titanium white. When her palette is ready, Sweeten creates her egg tempera paintings in a process involving building up and scraping away with tiny strokes, working on gessoed board. All her works are created in her studio from pastel sketches and watercolor studies made in the field. She completes a relatively small number of paintings a year and often an individual painting is completed over a period of years, involving many return visits to the original location. As Sweeten’s paintings immediately make clear, her primary inspiration is the landscape itself. However if she is pressed to name artists who have been sources of inspiration, Sweeten quotes American landscape photographers including Wright Morris, Dorothea Lange and David Plowden. Painting in oils, watercolors and acrylics also allows the artist to show a different response to the landscape, often with a geometrical simplification tending towards the abstract. All her work, however, shares the certainty of composition and controlled use of color, which together make the hallmark of an Anna Sweeten painting.